Dr Caroline Leaf – Thoughts are real. So what? Dr Caroline Leaf is a communication pathologist and a self-titled cognitive neuroscientist. Her entire preaching empire rests on her assumption that our thinking is the driving force of not just our mental health but also our physical health, and even physical matter! No one’s denying that thoughts are real. The key issue is not whether thoughts are real, but what thoughts really are. Professor Bernard J. Baars is an Affiliate Fellow at The Neurosciences Institute in La Jolla, California. He is a real cognitive neuroscientist. In the late 1980’s, Professor Baars built on Baddeley’s model of working memory by proposed the Global Workspace theory . Together with Professor Stan Franklin, also a real cognitive neuroscientist (and a mathematician and computer scientist) at the University of Memphis, they took the Global Workspace theory further with the Intelligent Distribution Agent model . Central to this model is the “Cognitive Cycle”, a nine-step description of the underlying process from perception through to action. In the model, implicit neural information processing is considered to be a continuing stream of cognitive cycles, overlapping so they act in parallel. The conscious broadcast of our thought stream is limited to a single cognitive cycle at any given instant, so while these thought cycles run in in parallel, our awareness of them is in the serial, sometimes disparate, streams of words or pictures in our minds. Baars and Franklin suggests that about ten cycles could be running per second, and since working-memory tasks occur on the order of seconds, several cognitive cycles may be needed for any given working memory task, especially if it has conscious components such as mental rehearsal . In recent years, the Global Workspace/Intelligent Distribution Agent hypothesis has been updated to help facilitate the quest to create different forms of artificial intelligence. The LIDA (“Learning Intelligent Distribution Agent”) model incorporates the Global Workspace theory with the concepts of memory formation to create a single, broad, systems-level model of the mind. Information within the cognitive cycle is broadcast to our consciousness in order to recruit a wider area of the brain to enhance the processing of that information [2, 4]. It’s the broadcasting of this portion of the information flow that renders it “conscious”. So thought is nothing more than a broadcast of one part of a deeper flow of information. In the same way that a projection on a movie screen is a real series of images of a historical or fictional event, but not the actual event, so thoughts are a real but are just a projection of the deeper information stream within the brain. This is very important, as it means that thought is not an instigator or a controlling force. It’s not a case of, “I think, therefore, I am”, but, “I am, therefore, I think. 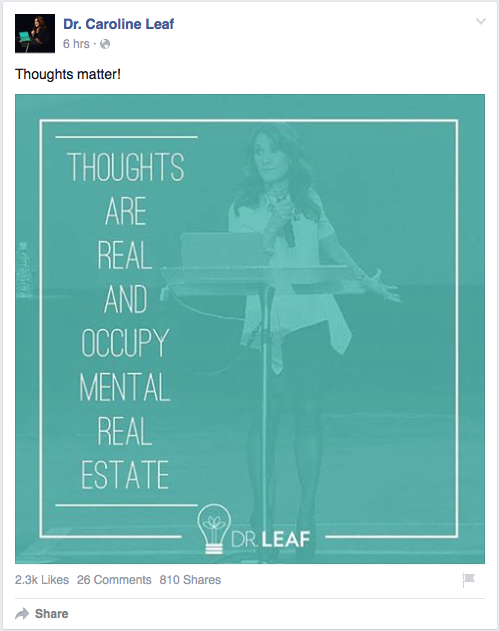 So Dr Leaf is right, thoughts are real. So what? Thoughts are just a projection, a function of the brain. They are not independent of the brain and they do not control the brain. And they definitely don’t control physical matter. In posting things like todays meme, Dr Leaf is proving just how far her assumptions are from the work of real cognitive neuroscientists, while misdirecting her audience, duping them into believing that her tenuous speculation is scientific fact. Baars BJ. A cognitive theory of consciousness. Cambridge England ; New York: Cambridge University Press, 1988. Baars BJ, Franklin S. How conscious experience and working memory interact. Trends in cognitive sciences 2003 Apr;7(4):166-72. Franklin S, Strain S, McCall R, Baars B. Conceptual Commitments of the LIDA Model of Cognition. Journal of Artificial General Intelligence 2013;4(2):1-22. This entry was posted in Biological, Caroline Leaf, Psychological and tagged cognitive cycle, cognitive neuroscientist, consciousness, criticism, dr caroline leaf, Dr Leaf, Facebook, Global Workspace, LIDA, neurobiology, pseudoscience, thought by cedwardpitt. Bookmark the permalink. Hi Matt. Thanks for bringing this to my attention. I saw it just before in my Facebook feed. I did smile at it. It’s just another example of Dr Leafs orthorexic tendencies and her common error of exaggeration which makes the meme sound unscientific. I think when we see it in the book there will be some cherry picked fact about coffee and changes in the epigenetic tags on DNA. Time will tell. Though I will say the latte art on the coffee in the photo was pretty clever. Whoever her barista was sure gets my vote.